Since 2011, a national electric car event has been held every year. Originally called National Plug In Day, it later expanded to become National Drive Electric Week. It’s actually nine days long, as it includes weekends on both ends. This year, I participated in two events. 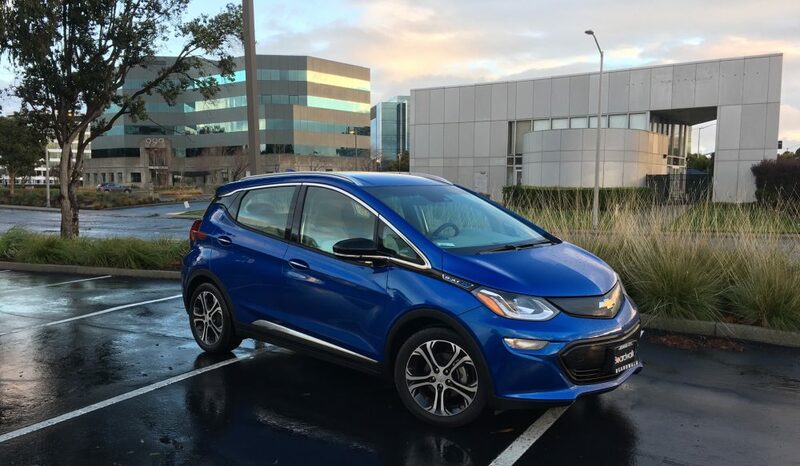 First, I hosted one at work for fellow employees, and later, I attended another, larger event, where I let people drive my 2017 Chevrolet Bolt EV to experience electric motoring firsthand. Marketo hosted its second annual National Drive Electric Week event on Thursday, September 13th. The weather cooperated, and the event went off without a hitch, although attendance was lower than anticipated. It’s understandable, though—people are working! Me with my Chevrolet Bolt EV–now an NDEW show veteran. Display cars included three Tesla Model 3s, a Tesla Model X, my freshly washed Chevrolet Bolt EV, a Nissan LEAF, a Volkswagen e-Golf, a BMW i3, and a Chevrolet Volt. One of the Model 3s was available for rides. Allyson Gaarder from the Clean Vehicle Rebate Project showed attendees how they could receive California rebates for buying a variety of electric cars. Vehicle owners gave attendees a tour of their cars and enjoyed talking with each other about the pleasures of electric motoring. Nissan supplied some swag, including water bottles, mini backbacks, pens, and tiny fans that attach to your phone. Attendees received a red token good for a $5 discount at the adjacent food trucks. On the last Sunday of Summer, Acterra, the Palo Alto environmental nonprofit, hosted its third annual National Drive Electric Week event. Acterra’s mission is to bring people together to create local solutions for a healthy planet, and they always put on a great show. Nissan brought a fleet of LEAFs for show and driving. EV enthusiasts shared their favorite electric rides with eager attendees. Booths provided information about rebates, vehicle charging, and a solar energy vendor presented solar options. Allyson was there with her booth and California rebate information. Event sponsor Nissan brought a small fleet of new LEAFs for show and drives. I watched the parking lot fill with Chevrolet Bolt EVs, BMW i3s, Nissan LEAFs, Tesla Model 3s, and even a low, sleek Fisker Karma. One guy brought his now rare Honda Fit Electric, and there was at least one tiny Chevy Spark EV and a cute little Fiat 500e. This was a popular event. Altogether there were 70 vehicles, representing 15 makes and models. More than 260 people registered and vehicle owners and fleets conducted more than 520 rides or drives! The beauty of these events, which Acterra hosts year-round, is the chance to learn about and sample multiple EVs in the same location, away from aggressive salespeople. With EVs, the owners are often more knowledgeable about the cars than a typical dealership employee, and they can certainly talk about day-to-day life with a plug-in vehicle. This event is both a car show and a ride-and-drive. Although it’s a little annoying to have to to readjust my seat and mirror settings when the day’s over, and having strangers drive your car can be a little nerve wracking, I like to let attendees get a personal feel for what driving an electric car is like. Luckily, all the people who took the wheel of my car were competent, responsible motorists, so I didn’t have any worry the entire afternoon. With high demand, I was busy non-stop. In most cases, I took the people for a ride around the short test loop, and then had them drive it. I felt it would make them more comfortable, and it let me explain the features first. Luckily, the Bolt itself is pretty straightforward and controls are where you expect them. People were surprised at the Bolt’s spacious interior, especially the generous headroom. One 6-4 gentleman pulled the seat all the way back and then forward a little! My drivers were also impressed with the video camera rear-view mirror, which gives a wider, clearer view than a regular mirror. When driving, my guests were fascinated by the low or high brake regeneration. If the transmission lever is in “D,” when you lift your foot off the accelerator, you keep rolling along, like with a normal automatic. In “L” mode, as you lift up your foot, the electricity flow is reduced, slowing the car. This lets you do “one-pedal driving.” It’s a wonderful way to maintain extra control of your car while generating extra battery power and saving your brake pads. At 4 p.m., we assembled inside the Acterra offices for the official launch of the newly renamed Karl Knapp Go EV program. Knapp, a beloved Stanford science professor of Civil and Environmental Engineering, promoted electrified cars and motorcycles for many years, and has been an inspiration to many. We had some food and drinks and watched a short video about Karl. Sadly, Professor Knapp is ill and was unable to attend. After the reception, I gave three more people rides, so I was one of the last to leave. It’s fun to share your EV, and I hope all of my drivers will go out and get their own! Electric cars are the future, and soon there will be many more choices. National Drive Electric Week is presented by Plug In America, the Sierra Club, and the Electric Auto Association. Sponsors include the Nissan LEAF (Platinum), Clipper Creek (Silver), and eMotorWerks (California Regional). Driving an electric vehicle (EV) is one thing you can do to lower your carbon footprint and help fight global warming and climate change. But electric cars start at a higher price than gasoline-powered ones, so what if you’re on a tight budget? The answer is to find a used EV. And in my community of Castro Valley, California, there’s a dealer that specializes in them—Rose Motorcars. I had a chat with Derek Dorotheo, 35, who calls himself a “car matchmaker,” and is nothing like a stereotypical pushy car salesman. Rose Motorcars was founded by Lyle Dizon and his two high-school friends, David Florence and Leo Beas. The company started eight years ago over the hill in San Ramon, and wasn’t focused on electric cars. However, they found a niche, and they now stock quantities of affordable EVs in their Castro Valley location, a former beauty school. Rose is the name of Dizon’s mother. The cars I saw in their lot included a line of brightly-colored Fiat 500e’s (their most popular item) and Chevrolet Sparks, sporty Volkswagen e-Golfs, a few tiny Smart EVs, a pristine white Mitsubishi i-MiEV, a boxy Kia Soul EV, a bright blue Mercedes-Benz B-Class, and in the small showroom, a couple of shiny Teslas. Rose acquires its cars mostly from auto auctions, but they also work with finance companies and wholesale partners on off-lease vehicles. They can buy directly at auction for a customer. They sell to individuals and also can ship a truckload of cars to a dealer elsewhere in the country who is seeking the little EVs. Taking an online stroll through the current inventory, sorted by price, you’ll see four Teslas, followed by a 2017 Chevrolet Volt at $25,888. Then come the VW e-Golfs at $15,000, and a Nissan Leaf at $11,950. After that, the Sparks and Fiats come in under $10,000. There are lots of choices between $7,000 and $9,000. And these are inspected, 2015 models in clean condition with 20-25,000 miles or less, with a few outliers. With the price of a new Fiat 500e starting at $32,995 before federal and state rebates and tax breaks, this is a huge difference. And since electric cars are simpler and require little maintenance, the cost of running them is lower, too. Granted, a Fiat 500e with its 84 miles of range is not going to cut it for a family of 5 or road trips out of town, but for the daily commute, it’s ideal. I know, because I drove a 2016 Fiat 500e for three months and it was perfect. Rose Motorcars is a no hassle, no haggle dealership, and wants you to be happy. For Castro Valley residents, they offer a 48-hour test drive, so you can see what the car is like to live with. You could grab it one day and try a run to work and back or do your weekend errands. While it’s not large, a little 500e or Spark hatchback would do fine for a run to Costco. You can also set up a FaceTime or Skype call to look at your car and buy it from home and Rose will ship it to you. They offer financing and take trade-ins, electric or not. In fact, they had a rare Pontiac Aztek in the back lot! So, you don’t need to spend a lot to help reduce CO2 and enjoy the pleasures of electric motoring. Just visit Rose Motorcars—in person or online. They’re located at 2806 Castro Valley Blvd. and are open from 10 a.m. to 7 p.m. Monday through Saturday and 11 a.m. to 5 p.m. Sunday. Find them at www.driverose.com. On the eve of the arrival of my long-awaited Chevrolet Bolt EV, here’s the finished version of a video review I did on the Fiat 500e EV last April. Unlike my normal one-week test period, I got a three-month loan of this cute little all-electric car. Thanks again, Scott Brown of Fiat Chrysler Automobiles. Little did I know when I got my Fiat test car on January 19, 2016 that a year later I’d be starting a new, longer-term EV adventure. But driving this car for three months gave me an appetite for gasoline-free motoring. I named the little blue hatchback Fidelio, and he was a faithful ride. There are lots of posts on Fidelio on this blog from January through April 2016 to read. Enjoy my wrap-up in this video. Should I Get My EV Now or Wait? Recently, with lease deals on EVs running at around $79/month (with a few thousand dollars down), I’ve been thinking about picking up one to use when I’m not testing other cars. After my three-month loan of a sweet little Fiat 500e earlier this year, I want to drive electric today, both because it’s the right thing to do for the environment, but also to practice what I preach. Advocating for a move to carbon-free transportation is fine, but sometimes you have to walk the walk, too. I believe that the upcoming Chevrolet Bolt, with its 200-mile range, vast dealer network, and attractive purpose-built EV design, will be a game changer for the non-wealthy like me. But I suspect that there will be no deals on Bolts, at least a first. There’s plenty of pent-up demand and they’ll have the only game in town–for a while, at least. So, I’m focusing on the Volkswagen e-Golf again, as well as the Fiat 500e and maybe the Kia Soul EV. The process of elimination removed Tesla from consideration right off the top. It’s way out of my price range, and there are no cheap deals to be had anyway. Others cut from the list include the Ford Focus. It’s a regular car that’s been electrified, and has only a 76-mile range. There’s the worthy and pioneering Nissan Leaf, which was built as an EV from scratch, but is looking long in the tooth with minimal changes since its 2011 debut. The availability of a bigger battery with 107 miles of range in the 2016 model is a small consolation. The Chevrolet Spark EV is cute and has great torque, but it’s kind of tiny. The Mercedes-Benz B250e and BMW i3 are appealing, in different ways, but are not as affordable as the three vehicles I mentioned at the top of this paragraph, if low price of admission is the goal. In any case, is it time to grab something now or to wait? I’m struggling with impatience but also with the knowledge that as with all things technological, the next improvement is right around the corner. You know that when you take home that new laptop, next week there’ll be one with a better screen or more memory or some amazing new feature. Here’s what you get if you wait. The new Focus is going to jump to 107 miles of range with the ’17s. The all-new Hyundai Ioniq is arriving this fall with 110 miles of range. The Bolt looms ahead appealingly. The Kia Niro will offer a hybrid in a crossover shape–and perhaps a pure EV someday. What will the next Leaf be able to do? We’re on the edge of a whole new generation of attractive options. To top it off, as I entertain a deal on the ’16 e-Golf with its 83-mile range, I just read that the ’17 is supposed to get about 125 miles of range with a new, larger battery. So, suddenly waiting a few months seems like a great idea, as long as I don’t need the car right now. The only down side is that the cheap lease deals may dry up once the next gen cars are out. Who really believes that a $79/month lease is realistic in 2016, anyway? It’s just a way to sweeten the deal on a car that retails in the $30,000-plus vicinity and has limited range. The companies are willing to move them out at a loss or minimal profit just to comply with regulations and maybe pick up some green cred for doing so. Perhaps, if you’re really eager, you could take advantage of a deal now on the shortest lease term you can get (24 months? ), and save up for the big transition two years from now, when you may be able to snag a Tesla Model 3 that someone ordered on spec or that fell through the cracks. Or, grab a second- or third-year Bolt with the all the bugs fixed. And the new Leaf will be out by then. As an EV cheerleader, and soon-to-be participant, that may be the best way to get in now at minimal outlay and plan for a long, enjoyable electric car future. But I remain perplexed. It does feel like sooner is better for the earth, but I want to have the best car for me, too. Most people understand that we are facing a climate crisis. Much of global warming comes from burning carbon, which creates CO2, which accumulates and, thanks to the greenhouse effect, keeps more of the Earth’s heat in, leading to rising temperatures, and all the consequences. Driving an electric car is a positive response to this crisis. The Fiat 500e is one of the most affordable ones, and it’s a joy to drive. It’s certainly the cutest electric car out there. The retro design is based on the 1957-1975 500, which served as Italy’s VW Beetle or Mini—an affordable and beloved people’s car. The gasoline model arrived 2011, and in 2013, the all-electric version debuted. Fiat graciously sent me the Celeste Blue model with the black and steam (white) interior I ordered for a three-month test. When the car was delivered, I photographed it, and a rainbow came out. That was a good omen. The driving experience has been wonderful. With 600 extra pounds of batteries over the gas version, the 500e sits firm and stable on the road. The old-fashioned dash panel brings a smile. Chrome circles surround the gauges and controls, and the white plastic panels emulate the original car’s painted metal surfaces. But this is no retro ride. It’s got full climate control, loads of airbags, heated seats, a navigation system, SiriusXM Satellite Radio, Bluetooth, and much more. The white leather steering wheel gives an upscale look and feel, like something from Coach. The 83 kW motor puts out 111 horsepower and 147 lb.-ft. of torque. It moves the nearly 3,000-pound 500e along like a mini rocket. The standard gasoline version has more horsepower (135) but much less torque (97), so the 500e is more fun. The one-speed transmission (no shifting needed with electric motors) is a set of four push buttons on the console. The 500e’s 24 kWh lithium-ion battery is rated at 84 miles per charge, although with careful driving, I often charged it up to a reading of as much as 109 miles. The battery comes with an 8 year, 100,000-mile warranty. For electrics, the EPA uses the MPGe calculation in place of MPG (no gallons). The 500e earns 121 City, 103 Highway, and 112 Combined. I averaged 138.2 MPGe driving 2,829 miles. The Smog and Greenhouse Gas numbers are both top-score 10’s. I took my little Fiat everywhere, except on longer trips. I didn’t want to risk running out of charge. It easily handled my 18-mile-each-way commute every day and went on a variety of errands around town. Thanks to the folding rear seats and hatchback, I carried my upright bass to orchestra rehearsals and concerts. I schlepped Blues band gear to shows. I hauled loads of groceries. I did most of my charging at work, on a nice set of six ChargePoint units. I plugged in when I arrived, and by late morning, the ChargePoint charger sent me a text that the battery was full. I went down and unplugged, so another EV driver could charge up. We have an informal community of EV drivers at work, and people are excited about their cars and want to talk about them. Charging at 240 volts (Level 2) at work takes only a few hours. At home, at 120 volts (Level 1), it takes overnight and then some. If you own an EV, you should look into installing your own Level 2 charger. Driving is blissfully silent, with minimal road or wind noise, which means great music listening. The simple instrument panel features a center round gauge that prominently displays digital speed and range. On the left, there’s a graphical and numerical display of battery charge. On the right, you can monitor driving behavior with colors on a curved bar. Eco—green—is normal driving. Power—red—is when you’re accelerating hard for passing or entering the freeway. Charge—blue—indicates regenerative braking, which helps recharge the battery without plugging in. My daily charge at work cost about $2 to $2.50. Electricity would be cheaper at night at home. The window sticker states that the estimated annual fuel cost is $600, a $6,000 savings over the average car. And maintenance costs are very low for EVs, with no oil changes and fewer moving parts to break. My car retailed at $33,190. However, most of these cars are leased, and some amazing deals are available. Federal and State rebates help make it affordable. Gas-powered 500s start at just $18,490. I fell for my baby blue Fiat 500e, and named him Fidelio. I’ll truly miss having him around. He was totally charming, relaxing to commute in, and handled all my normal driving needs. And for longer trips, we just took the family car. April 22 wasn’t a day I was looking forward to. After just over three months, it was time to turn in my test Fiat 500e, Fidelio. But, I did what I had to do, and handed over the keys. I’ll publish the article that will appear in my newpaper venues and their websites in my next blog post. All of these blogs have been part of my day-to-day life with an all-electric car. Fidelio performed just as he had to, and took care of all of my needs, except one. His range, at 84 official miles and a little more in reality, was perfect for commuting and errands, but just not enough to make him a car for all reasons. Would that be enough to keep me from running out and buying a twin of this sweet little car? Maybe. For now, I have lots of happy memories. He was completely charming and ran flawlessly. Stevegoesgreen.com will continue to cover electric and hybrid (and alternative fuel) vehicles. Stay tuned! As I ascended the hill on the way to Pleasanton yesterday, I looked down at my range indicator and saw that it might be a little risky making it home on the return trip. The number was in the 20’s, and with the climb back, I got a little nervous. The solution? Public charging! Because I’ve been organized around charging at work and occasionally at home, I haven’t really used public chargers. But I was set up for it, and that’s what I did. First, I consulted the Plugshare app on my phone. It showed me two options within a couple blocks of my brunch destination. I pulled in behind the old Library on Main Street, and there was a single Chargepoint station, ready for me. I backed in, and plugged in and that was that. With Plugshare, I was able to check in, and even post a photo of Fidelio getting his electricity. We had a relaxed brunch at Nonni’s Bistro, a favorite destination, and walked around a bit in downtown Pleasanton, a place that deserves its name. I checked the progress of my charge using the ChargePoint app. Notice at the bottom, the progress–miles of charge–is displayed. By the time I got back to the car, it was 100% charged. Now that’s the way it’s supposed to work. And it cost me $1.00 an hour. It was a happy story, but I wondered what would have happened if the charger was occupied? What if there wasn’t one nearby? We need to build out the infrastructure as more and more EVs hit the roads, just for this purpose. Charging at home and at work is great, but sometimes you need it on-the-go.